On your mark, get set. Go! Shares of Nike (NKE) jumped 5% Friday morning, after the company's second quarter results topped analysts' expectations. Nike said late Thursday that earnings rose 11% on sales of $6 billion in the quarter, driven by surprisingly strong demand in North America. The company also said future orders for Nike footwear and apparel were up 14% in North America. These orders would be delivered in the December to April period. Investors cheered Nike's performance in the United States and Canada -- two markets that are considered mature and usually have less potential for growth. The rebound in North America could help Nike offset continued weakness in China, where sales fell 11% in the quarter, according to traders on StockTwits. Assuming China avoids a hard landing, Nike should be able to cash in on robust growth in the world's second largest economy. $NKE china is just beginning its turn around, if nike can produce this with weak china, next quarter will be huge! 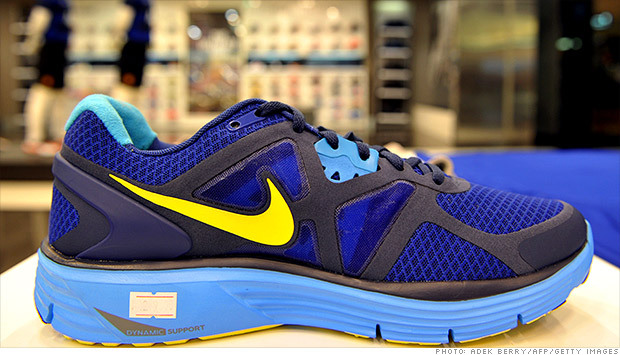 Nike announced a two-for-one stock split in November, the sixth in its history. The stock now trades above $100 a share. Don't forget, $NKE has that stock split coming up on Dec 24. If you owned b/4 Dec 10, you'll get two-for-one. Other traders pointed to Nike's global footprint, saying the stock is relatively cheap for such a well known brand. Love that $NKE is doing what I thought without a peep about data and lifestyle mechanics ....cheapest great brand in world.